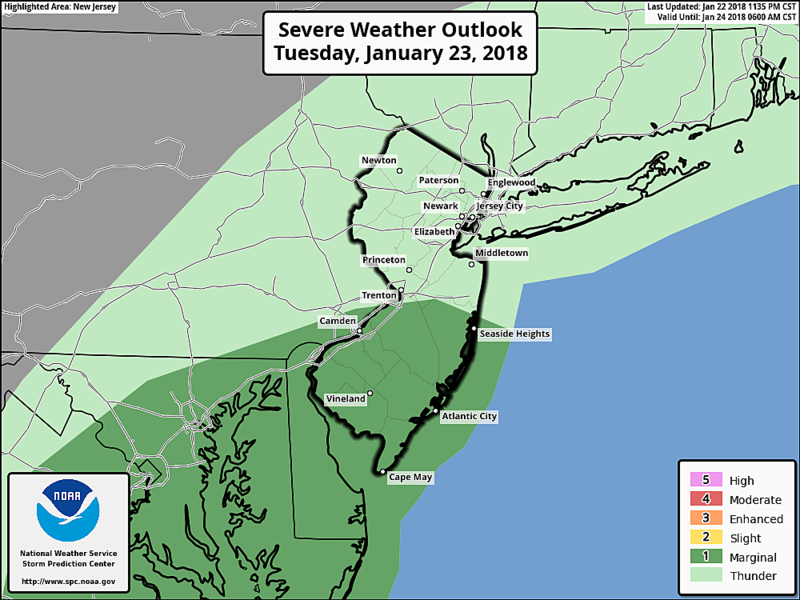 Periods of rain are in the forecast for the Garden State on Tuesday, with occasional downpours, patchy dense fog, and rumbles of thunder possible. Umbrellas up! 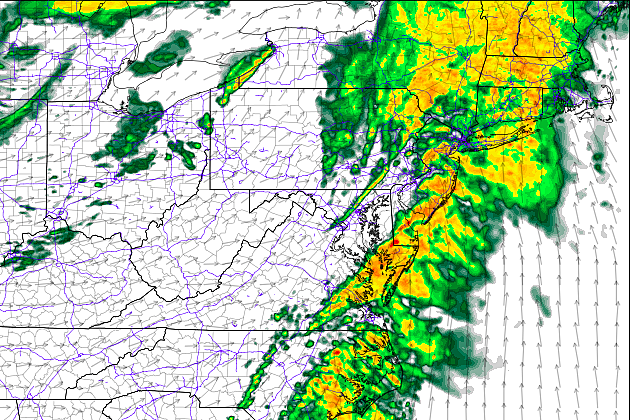 Healthy rainfall pushes through New Jersey for most of Tuesday. With about 40 percent of the state still classified as "abnormally dry," we should be happy about every drop that falls. And for my fellow winter-haters, we can rejoice that today's active weather is wet, and not wintry. As of this writing, we've been plagued by locally dense fog and one fast-moving batch of moderate to heavy rain. As temperatures rise a few degrees, the fog will become less of a problem. Periods of rain, however, will continue for most of the day. The heaviest rain will likely fall between 8 a.m. and Noon, with pockets of steady rain potentially continuing through about 3 p.m. It's not a "total washout," as the rainfall looks to be "on and off" throughout the day. Most of the state will see about 0.50" to 0.75" in the rain gauge, with some totals over an inch possible where it really pours. High temperatures for Tuesday look to mostly end up between 55 and 60 degrees — that's 15 to 20 degrees above normal for late January. It'll be breezy too, with sporadic gusts over 20 mph. That warmth will also destabilize our atmosphere, which introduces a chance for thunder and lightning within the strongest rain cells. The Storm Prediction Center has even placed the southern half of New Jersey in a "marginal" risk for severe weather — that's the 2nd lowest of 5 risk categories. If a storm gets going, it may produce gusty winds. An isolated spin-up tornado isn't out of the question either. Just stay alert to changing weather conditions on this messy, wet weather day. We may see a few breaks of sun, just before it sets late Tuesday afternoon. Skies will continue to clear overnight, as cooler, drier air returns behind our latest cold front. As I've been advertising for several days, this is not an arctic blast. I don't think we'll even need to worry about the flash freeze potential. 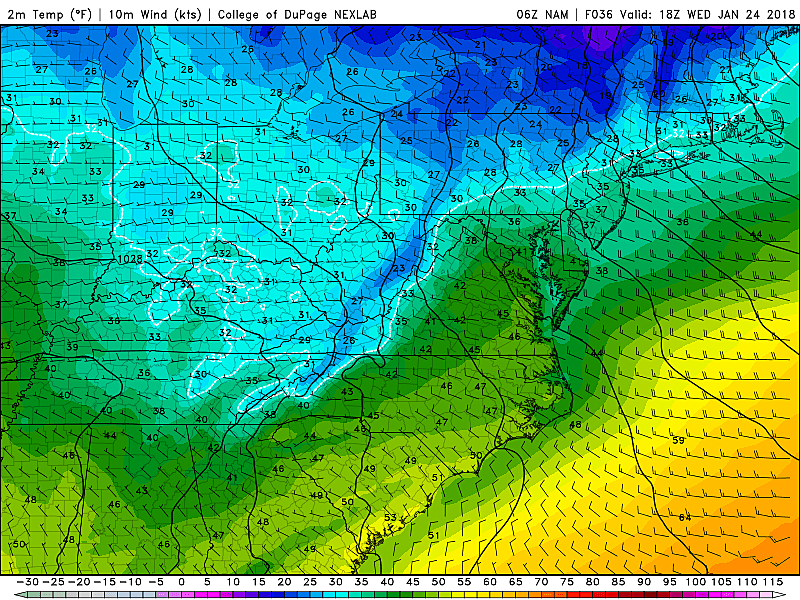 Overnight lows will end up in the mid 30s — most (but not all) of NJ will stay above freezing. Wednesday will be noticeably cooler than the past several days, with high temperatures barely peaking above 40 degrees. Much more typical of a late January day, we'll see partly sunny skies and a continuing stiff breeze up to 20+ mph. Thursday looks to be the coldest day of the week — but even that's not saying much! Morning lows will be in the lower 20s — that's near-normal for this time of year. Afternoon highs will be in the mid to upper 30s — that's only a few degrees below late January normals. Winds will be light and skies will be sunny. So, overall, not bad! Friday will recover to the near-normal upper 30s to lower 40s, again with plentiful sunshine. It looks like we'll enjoy another warmup for the final weekend of January, with highs back in the 50s for Saturday and Sunday. Models suggest a few rain showers will be possible late Saturday through early Sunday. Another chance for snow showers pops up late Monday, with light accumulations possible in North Jersey. Next significant storm isn't in the cards until the first few days of February, at the earliest.